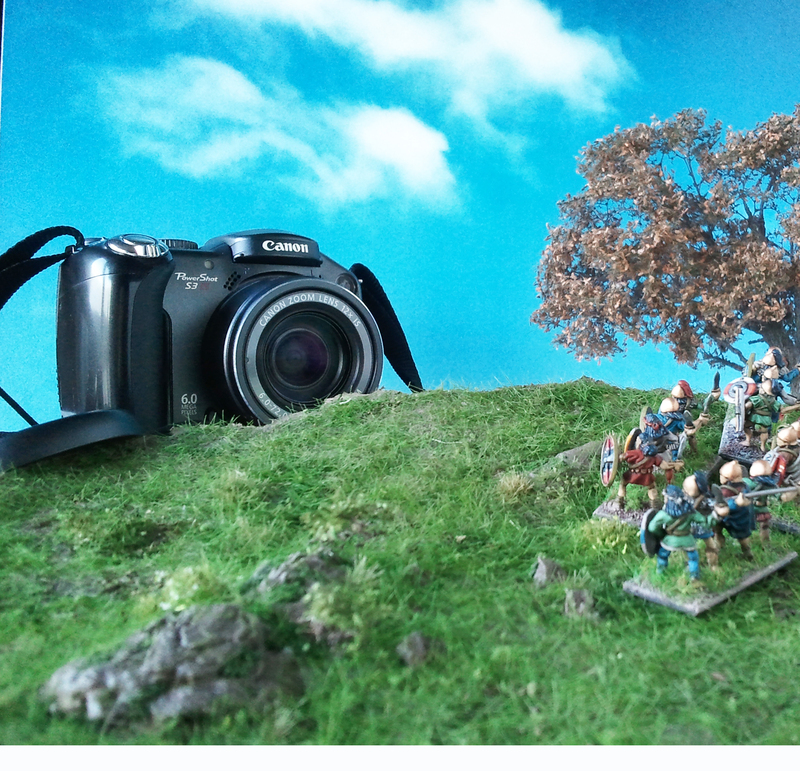 Arguably the camera you take your photos with is one of the most important aspects of miniature photography. 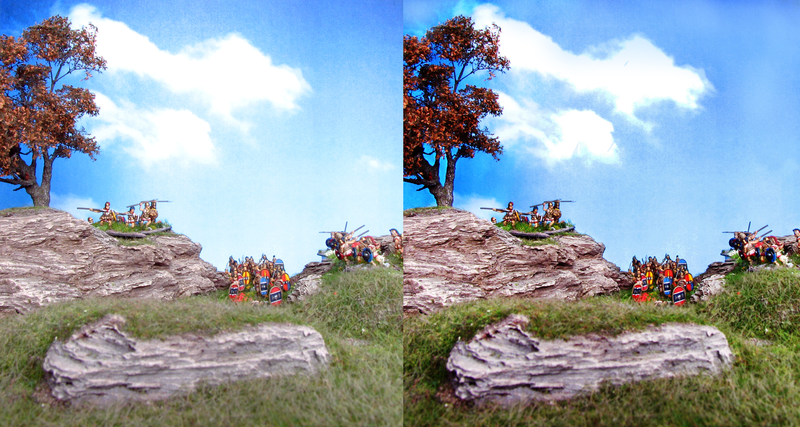 If your camera has problems taking good general pictures it will have problems taking close-ups of delicate 28mm miniatures. You don’t need to invest in a SLR, but if you already have one with the proper objective you are well advised to use it. Assuming you have a point-and-shot camera it is important that it has a reasonable macro setting and at least the option to manually adjust the F-number and the shutter speed. If you have a camera that does not offer any of those features you might still be able to use it, but make sure to figure out what the minimum distance is it can take a focused picture. It is also important that your camera has a shutter delay option. If this is not the case, you can also use a small table tripod or put your camera on an even, make-shift, base. I found magic cards to work well for this, as you can take some out of the stack to vary the height. Canon Powershot SIII SI attacked by some very confused Celtiberians. I use a Canon Powershot SIII SI for all my photos. You can only get it second-hand these days, but you might look into one of its newer incarnations. I like this model because of its very good macro function. You can literally focus on a corn of dust on the objective. It also offers a wide range of presets combined with a fully manual mode. I also used it continually during the past 10 years without any technical troubles so far. In short: A good macro function, stable base to rest your camera on and a shutter delay option warrant pictures that are not blurry. Lighting is hands down the most important aspect of taking good pictures. No matter if your photo is overexposed or underexposed, it will affect the impression a viewer will get of your miniatures. Highlights and shadows are swallowed and colours appear very different than they do to the naked eye. I got excellent results with the cheapest option: daylight. Just take your pictures close to a window. I recommend to take pictures in the morning as the light is really good then. Direct sunlight is not a good idea, as you want diffuse light without a tendency to cast stark shadows. This is my go to table setup these days. Background, white reflective foam board on one side and whatever props I need for a specific shot. If you can’t take pictures in daylight, you can use a number of daylight lamps, but these have the problem of sometimes changing the hue of the pictures or being to stark. You can diffuse the light here, too, in using some parchment paper. Just fasten it in front of the light source. This is my old photo setup with two daylight lamps, a stack of magic cards to rest the camera on and a blue sheet of styrofoam for the background. In short: Good lighting is very important. Natural daylight works best, but avoid direct sunlight. While a camera can be an expensive toy, the actual materials you need for the background and for reflecting the light are very cheap and widely available. For an evocative scene we need some sort of photo background. You can use quite distinctive landscapes for this, but there might be a disconnect between foreground and background, especially if the terrain pieces you use differ stylistically from the background photo. 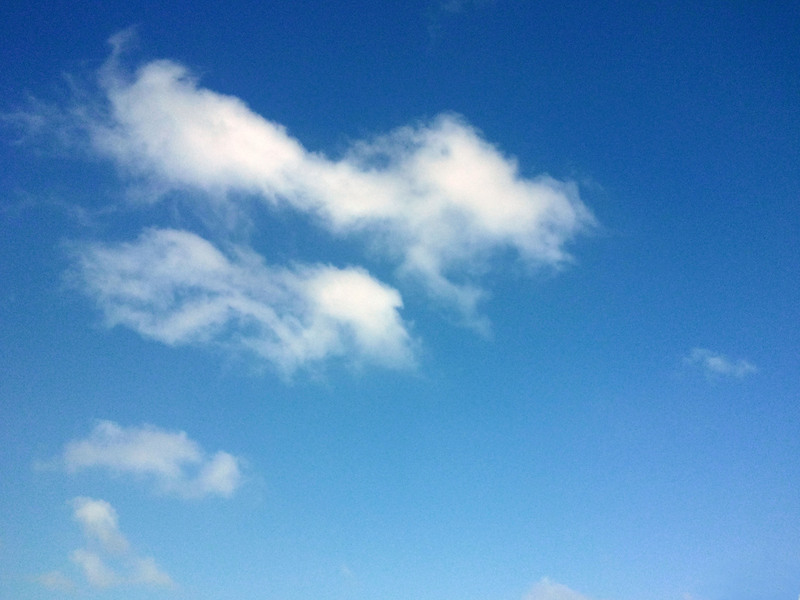 I think what works best is a nice neutral sky. Some clouds can add interest and you can also experiment with a star lit night sky or a sunset. 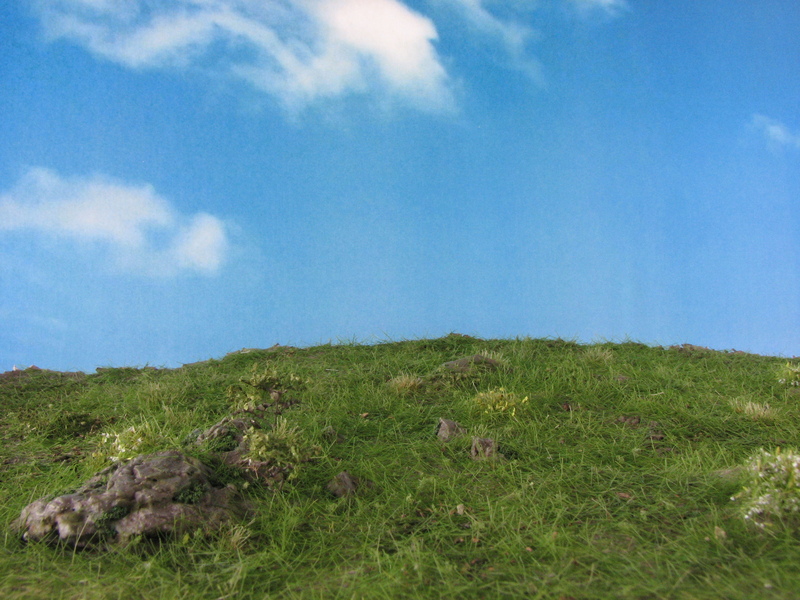 Feel free to use this background for your own photos. Blue Sky with Clouds by DaggerAndBrush is licensed under a Creative Commons Attribution-NonCommercial-ShareAlike 4.0 International License. Print the photograph on a DIN A3 page (laser printer recommended) and cut off any white borders. You could also try to find matte photo paper in this size, which will give a superior result. Glue the print on a cut-to-size piece of white foamboard. Finish it with a light cover of matte varnish to reduce any lustre (not necessary if you use the matte paper). If you used an inkjet printer don’t do this or the colour may run. There you go, the photo background is ready. You can also attach an alternative background on the other side of the foamboard. To reduce shadows, evenly lit your miniatures, and to show all the intricate details to the viewer, you need something to reflect incoming light. If you have some scrap pieces of foamboard lying around after you made the background, you can use these pieces to reflect the light back onto the scene. I always put one large sheet opposite the light source and then several small ones were I feel more light is needed. You can fixate these pieces with blue tack. However, be very careful that the background does not reflect any incoming light. This also implies that the background should be positioned perpendicular to the lightsource to minimise reflections and resulting glare. Try to avoid glare. This can ruin an otherwise nice picture. Here I just cropped the picture to get rid of it, but this will not always work. It is better to position the background perpendicular to the light source to minimise glare or reflections. The surface you take your pictures on needs to be even and large enough to hold your scene. However, you also need some suitable groundwork to create a sense of space and a realistic final result. For this purpose, especially if you don’t have a big gaming board, you can use the versatile caulking mat technique to create a photography mat. Follow the link for an excellent tutorial by Sir Tobi. 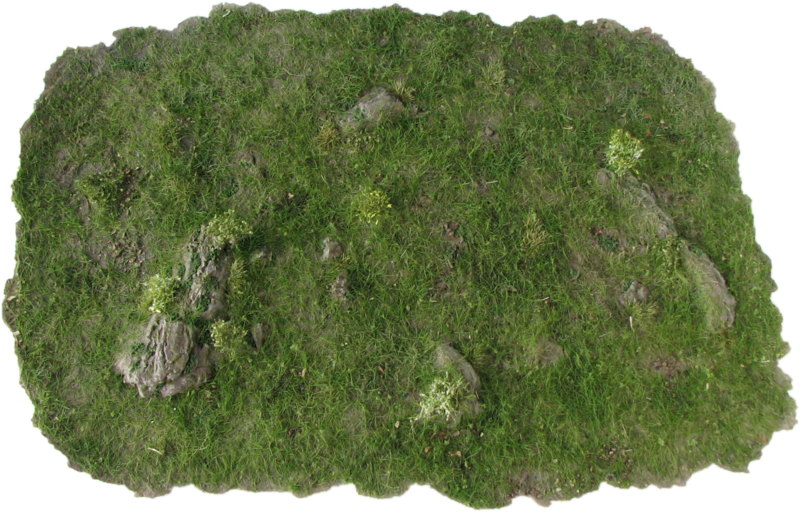 Given such a mat is flexible, you can easily create new scenes with rolling hills or flat ground. For some of my shots I use this flexible mat (follow this link to the tutorial). I will make more mats to depict different environments. They can also be used in your gaming as difficult terrain. Now it is time to be creative. A good shot begins with a good idea for a scene. What story do you want to tell? Who are the protagonists? What are your limitations terrain wise? Answer these questions first and then select miniatures and terrain pieces to bring your idea to life. This is really were you have to develop a feeling for what works and what does not. Both shots have a lighting problem, but the scene is also not very engaging. On the left the Celts are too dark. This is somewhat mitigated on the right. 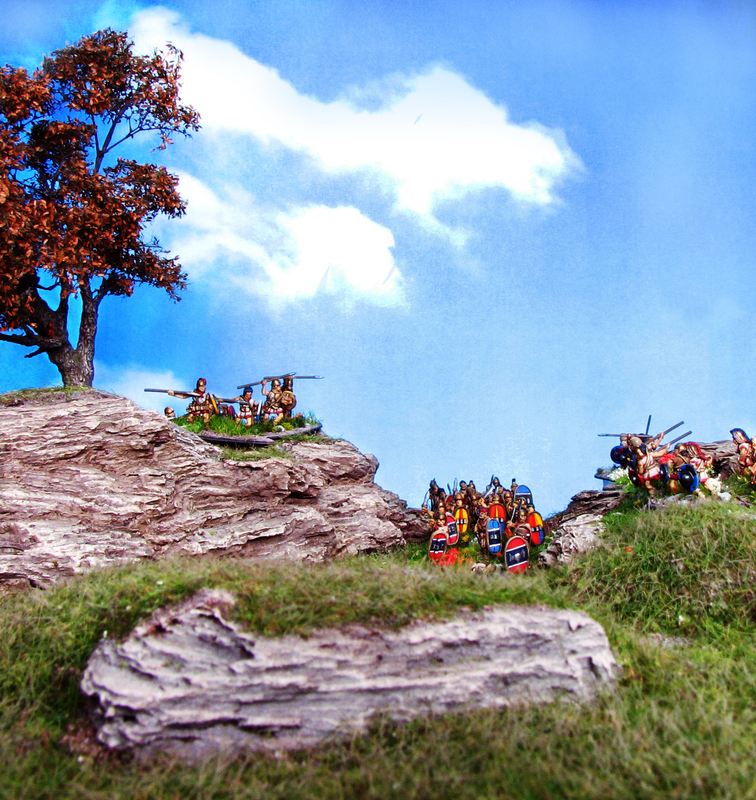 However, the camera is too close, not allowing to really get the impression of a battlegroup advancing. 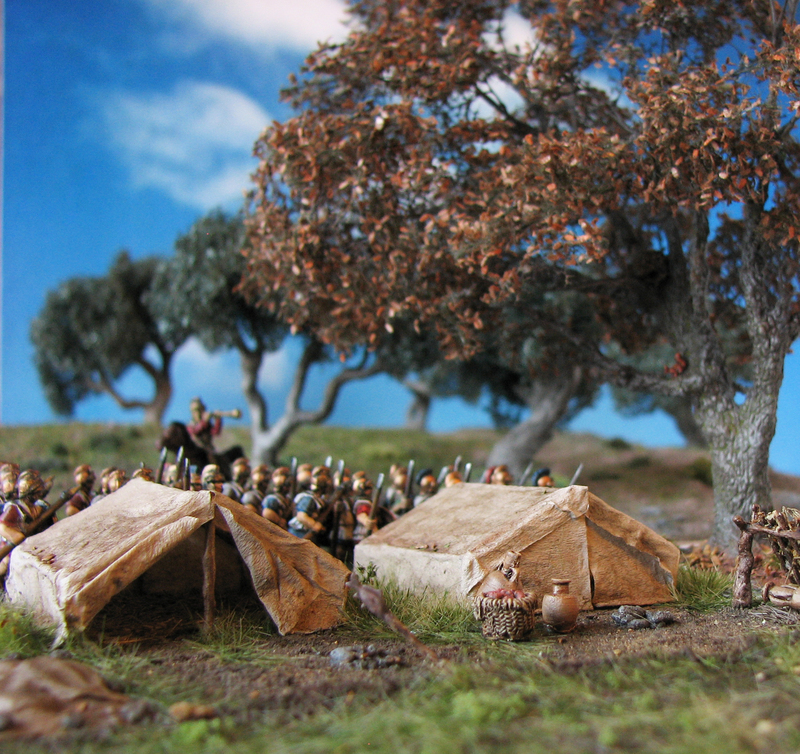 Changing the trees in the background from pine trees to olive trees does give the pictures a different mood, but does not affect the composition as much as the placement of troops and proximity to the camera. This ambush scene is a good example how the scale of an engagement can be conveyed in using a wide-angle shot. Unfortunately the background is not evenly lit, but it is not as much a problem here. Another thing to consider is how elements in the foreground work with elements in the back. The cliff face in the front can look a bit out of scale, because it is so close to the camera. You also need to take the perspective into account. What looks good from a bird’s-eye perspective may not work with an eye-level perspective (that is the level of your miniature’s eyes) or vice versa. The tree you positioned in the foreground may now look out of scale or the hill in the background doesn’t show its nicely carved rock face. As you can see, all things being equal, the perspective makes quite a difference. In the left picture one feels much closer to the action and assumes the role of a spectator. The picture on the left side has, however, another problem: The background is not evenly lit, a problem you encounter often when taking pictures using artificial light. In addition the trees cast shadows that are a bit too stark. The picture on the right has a similar problem. It is a bit dark which makes it very hard to see all the details. Another example illustrating the importance of proper lighting and the difference even slight variations in perspective can make. On the left the picture is way too dark. 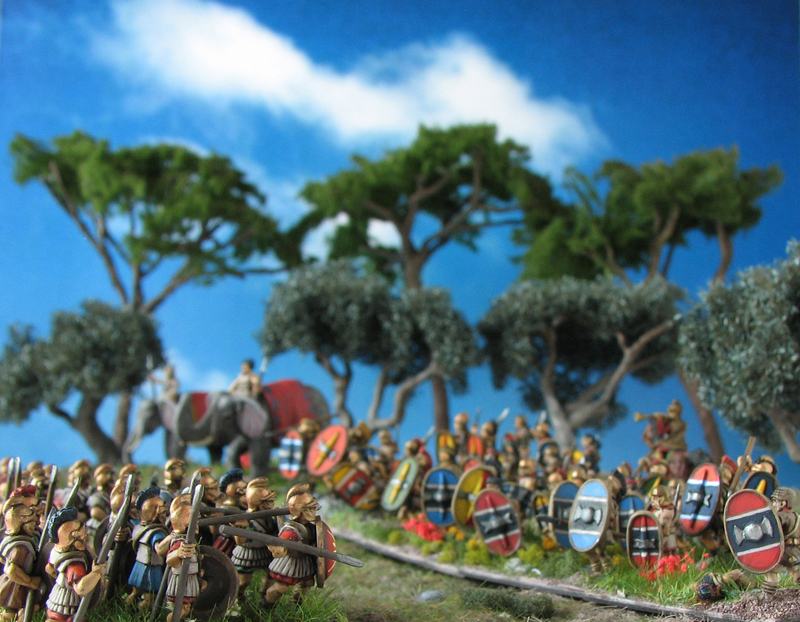 However, the miniatures in the foreground are focused and the viewer gets the impression to stand on the field. On the right the lighting is much better, but the miniatures are out of focus. The point of view is also a bit high, giving the whole scene more of an birds-eye effect. Argueably this is a much better composition showcasing two of the models used in the shots above. 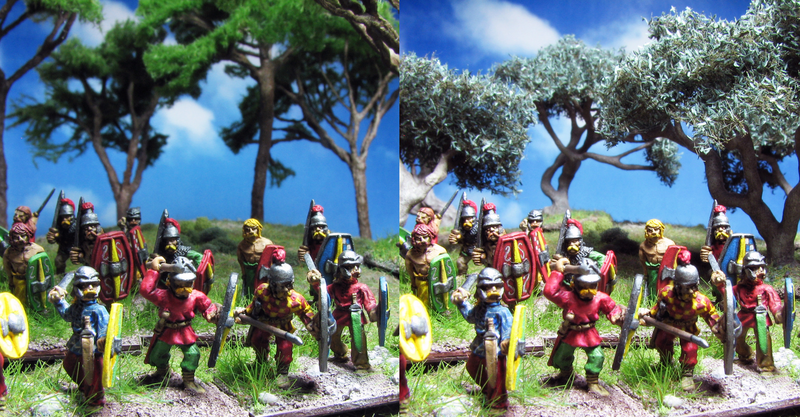 The background is evenly lit and with only a single tree and two miniatures the scene is more focused. In selecting the poses carefully the idea of two men on watch can be easily conveyed. This is further emphasised by the cliff face. It not only suggests an elevation, but also frames the picture. Make a couple of test shots to establish if the scene works. In time you will be able to judge this more easily. It gets more complex if you want to place whole regiments or depict a battle scene. Make sure they don’t cover each other up or are at an odd angle. Sometimes weapons overlap and give a strange appearance. You might also need to elevate some of the miniatures to present them properly, even though they look alright from above. Another thing to consider are bases. Naturally a desert or snow scene would ask for matching bases, but with using perspective effectively you can take a photo that will not show the bases prominently. A good strategy is to use the base of a terrain piece or a rockface to hide the bases. 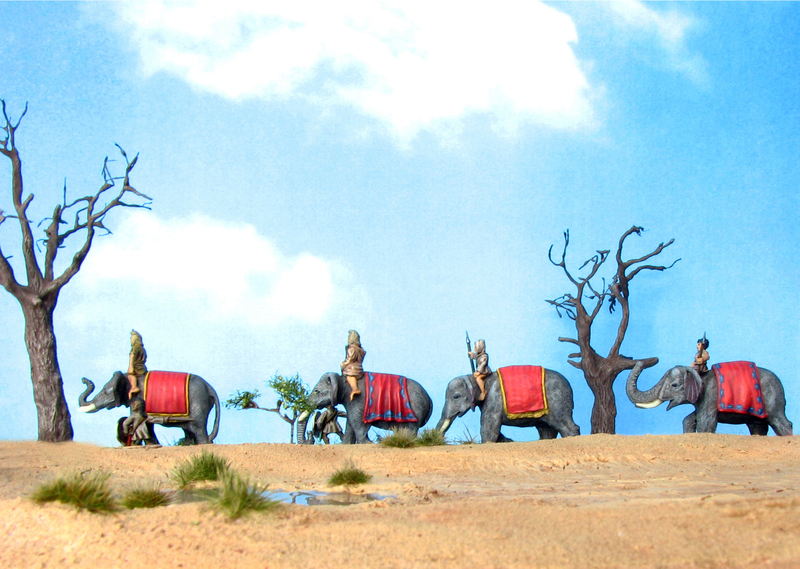 The elephants have a base that depicts lush mediterranean vegetation, entirely unsuitable for a desert scene like this one. However, in positioning the camera such that the desert terrain piece hides the bases, this problem can be solved. While the picture is reasonably nice, it has a flaw: The tree on the right side casts a shadow on the background. It would have been better to move the background further back or to use some foambaord to reflect some light to the darkened area. The scene is set up and you are ready to take your pictures. Now you have to decide which section of your scene you would like to photograph. You will be limited by the size of your background to some extend. You do not want your living room to show on your photo and using Photoshop to fill in those gaps in your background is time-consuming. If you are not adept in using Photoshop it might just not look right. So make sure that you frame your picture right the first time and save yourself some frustration. Instead of rearranging your whole scene it is often easier to move your background slightly or correct its angle. 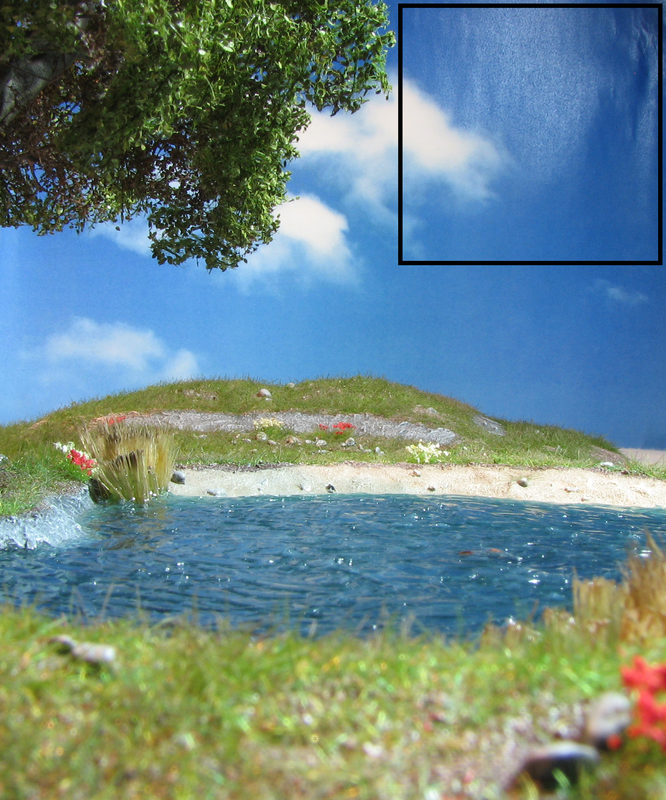 It is also a good idea to use some of the terrain features to frame your shot. A tree to the right gives your shot some closure and provides a visible border. Movement can be suggested by portraying only part of a unit coming in the scene from the left. You can also use artistic blur to focus the gaze on a specific section of the picture. You need to experiment a bit with your F-stop here to achieve the desired result. This is obviously much easier to accomplish with a fully fledged SLR, but a digital camera with the option to manually adjust the F-stop should allow some control. 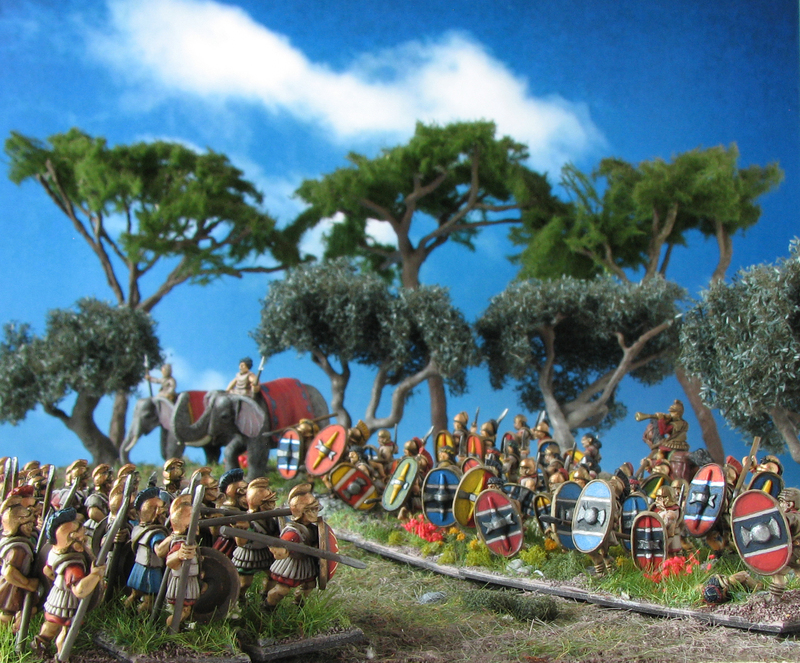 Without artistic blur the emphasis is on the entire battle line. Here the blur focuses the gaze on the spearmen in the foreground. It also blends the background in with the terrain pieces. After you took a number of pictures it is time to start-up the PC and use a program like Photoshop or Gimp to make some final adjustments. I usually limit this to cropping the picture. However, sometimes you only realise sitting in front of your PC that there is a small gap in the background, speckles of dust or a fibre somewhere. Here the clone stamp tool comes in handy. This Youtube tutorial by EverydayHDR shows you how to do it. The eraser tool can also help to remove unwanted shadows and gaps in the background, but this more of a problem if you take pictures in front of a neutral background, for instance a white one. With Photoshop or really any photo editing program you can also correct colours and modify specific areas of a picture, e. g. to increase or decrease brightness and contrast. This video tutorial by Michelle Kane shows you how to utilise layer masks to achieve this. However, this is time-consuming and it is a much better idea to get it right when you take the picture. To avoid frustration always keep your scene assembled and note down your camera settings until you looked at the pictures on your PC. You might find the camera’s LCD screen did not give you a good impression of highlights and shadows, contrast etc. In this shot I made an attempt to correct the uneven lighting of the background with a layer mask and also to saturate the colours more. I also darkened the tree slightly, as it would cast a shadow. Still, if I would have corrected these problems when taking the picture the result would be much better. 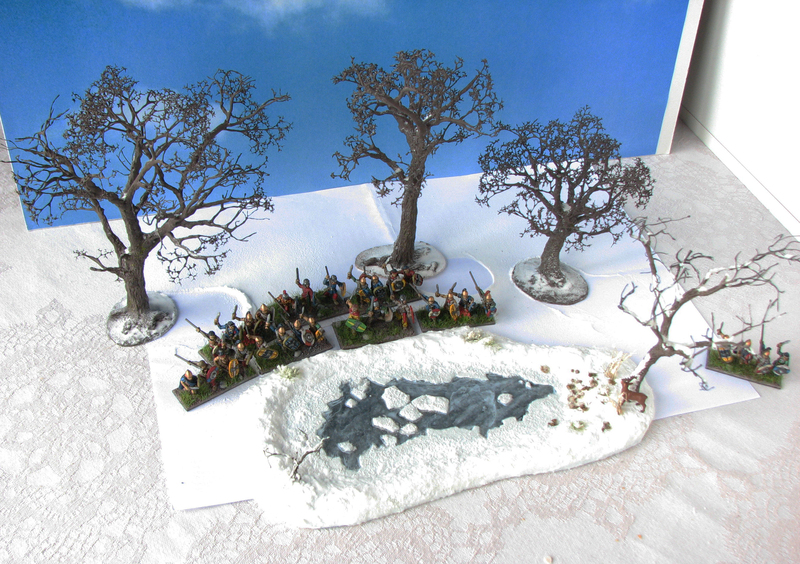 To take evocative scenic shots of your miniatures you need some time on your hands, patience and imagination. All the technical skills will develop in time and through trial and error. However, for a good start make sure that your camera has a good macro function, a shutter delay option and is sitting on a stable surface or a tripod. Good lighting is essential with natural daylight working best, but avoid direct sunlight. Using some foamboard to reflect light will get rid of stark shadows. Take your time in creating your scene. Use a flexible caulking mat as groundwork and keep the perspective in mind when setting your miniatures and terrain up. Try to get the best picture possible to save time when it comes down to final editing. Make use of photo editing software if necessary, but try to keep it to a minimum. If you follow these guidelines you should have an agreeable picture in the end of the process. If a professional photographer should read this who also happens to be a wargamer, please feel free to provide suggestions. I am always interested in refining my photography skills. Other comments are obviously welcome too. 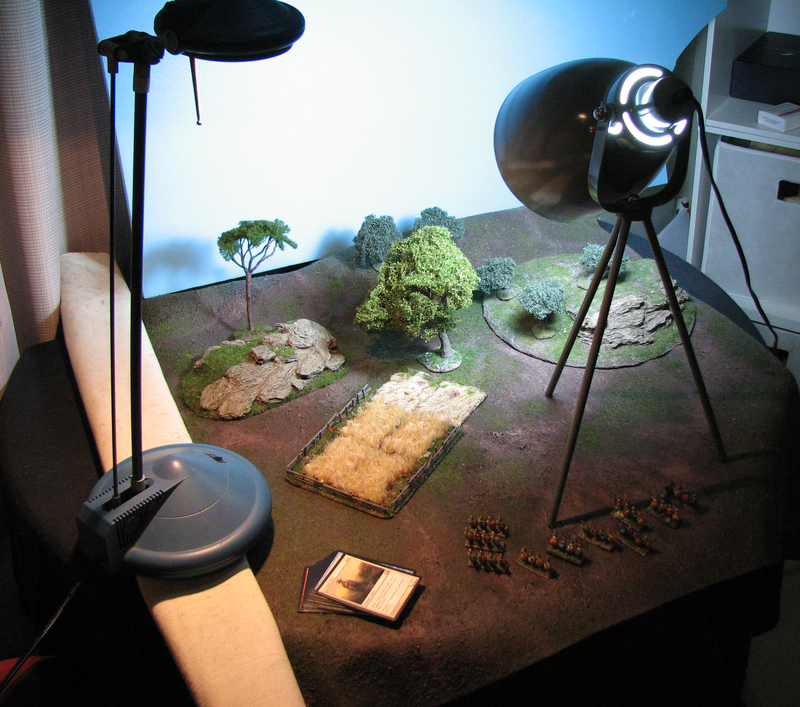 Share your own photography experiences or include your favourite scenic shot of your miniatures! I like the idea of using parchment paper on a daylight lamp,never thought of that before. Excellent tutorial as usual sir😀 . I am also about to get some landscape photos mounted panoramic style onto some card for background use so I will let you know how this turns out . Thank you. Parchment paper works indeed quite well and does not block out as much light as a proper lightbox would. I’ll be very intersted in your choice of backgrounds. I am still looking for some stuff that is in the public domain (or provided free to use via creative commons). For instance a forest or a valley. thanks a lot for the tips. well done with all the photos, they look awesome! Thank you for your comment. Glad the tutorial is useful! Great tutorial! I hope to put these lessons to use this year. Thank you very much! I look forward to your creations! Fantastic job on the tutorial! One thing you didn’t mention, that I’ve noticed you often do in your photographs, is to have objects in the foreground, middle ground, and background. It’s a really effective way to make a rich scene, helps make the use of depth of field more effective, and gives you opportunities to lead the eye through the picture in multiple directions. Must be natural talent, then! Da möchte man direkt die Kamera auspacken..
Habe gerade gemerkt, dass ich nicht auf dein Kommentar geantwortet habe. Schön, dass das Tutorial eine Inspiration war. Bei deinen/euren Photos geht es mir ebenfalls so und ich bekomme direkt Lust eine neue Periode/ ein neues Spielsystem anzugehen.